Clark, the founder of Artistic Urns, has been woodturning for “over a quarter of a century” is what one of his business partners will tell you. He was drawn to this art form by his desire to work with his hands and his love for the inherent beauty in wood. "The excitement of opening a log to expose the beauty nature has hidden inside is too much to resist. It is my hope to create a shape or form that will do it justice." Clark trained and studied with master artists from the United States as well as from around the world. He worked under Rude Osolnik, a founder of the Southern Highland Crafts Guild, and grew up fraternizing with Ed Moultrops, a modern day woodturning legend. 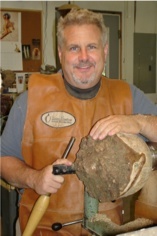 He has been active with American Association of Woodturners (AAW) and Georgia Association of Woodturners (GAW) where he has served as president and held many other offices. 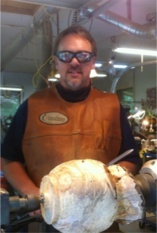 Clark has always believed in giving back by providing help and assistance to beginning and advanced woodturners alike. Clark’s work is highly sought after and has been shipped to collectors across the world. His pieces have been on display across galleries in New York, San Francisco, Los Angeles and Atlanta. Tiffany’s Fine Jewelry used his work to complement their storefront displays. He has contributed pieces for charity, helping out Habitat for Humanity, Selected Education Trust and Safe Kids. Today Clark's primary focus is creating one of a kind cremation urns. He has discovered a way to use his unique ability to create beautiful vessels that can honor the memory of a loved one with a truly beautiful piece of art. Chris became attracted to art and photography at an early age. At 10 years old he experimented with developing photos in unique ways that created some very “odd” results increasing his curiosity. Interest in photography was not his only love of art. Chris took to working with wood by whittling out crude 3-D objects. In high school he took industrial arts where he worked with both wood and metal. After high school Chris purchased his own knives and chisels to satisfy his continued urge to work with wood. During this time the passion for photography continued to blossom. Chris set his sights on Photography as a career, enrolled at the Art Institute of Atlanta and finished in the top of his class. He set out freelancing and assisting in the commercial photography and film production industries. He set up a studio at Murray Mill, an upcoming art district in Atlanta. Living among many artists, he began exploring other mediums of art and soon had various projects always in progress. A signature style of sculpting became his chain saw carving of life size figurative pieces, furniture and eventually totem poles. Later Chris inherited a 100 year old wood lathe, and memories of turning on a lathe back in high school got his creative juices flowing. Chris became engulfed in turning wood and immersed himself in studying the craft by reading books, attending clubs, watching videos, and seeking out advice from other wood turners. Searching for an old high school acquaintance he remembered turning wood, Chris found Clark McMullen and Artistic Urns. After visiting the studio he became instantly attracted to the idea of making beautiful vessels with such craftsmanship and one-of-a-kind artistry. Chris joined Artist Urns in 2011 and currently designs and turns urns for appreciative families around the country and elsewhere. Amy has always had enthusiasm for art. All during her school years she actively participated in state art competitions winning several awards. She has worked in many different mediums; tile, paint, clay and wood. 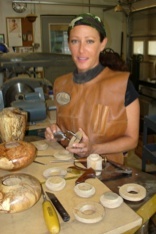 She started working with wood with her dad when she was 10 years old, and always enjoys working with the natural mediums. Amy brings tremendous creativity to Artistic Urns. Her background includes interior design and kitchen remodeling. She has worked extensively in the hospitality industry requiring a keen focus on customer service. Skills in catering, event management, restaurant operations and floral arranging provide Amy the ability to pull things together beautifully. Her eye for appeal and demand for detail are invaluable to the studio. Amy can tackle any task necessary, and assists in everything from turning, sanding and finishing to packaging, shipping and billing. Amy makes sure things get done, and that is not always an easy task working with artists. 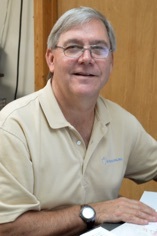 Allen is in charge of Artistic Urns marketing and adds tremendous creativity to the business side of the business. Ever since grade school he has always been caught “doodling” with a pencil or pen. Influenced by Yes’s album cover artist Roger Dean and architect Frank Lloyd Wright, his style of creativity is a very unique detailed one. Playing with today’s graphic software, Allen can cut, paste and create literature and marketing props with the best of them. His creativity and abilities benefit the business beyond the office. Wood shop was a favorite elective in high school and provided Allen with the skills to help in the studio whenever needed. Leaning on his brother Chris’s photography background, Allen takes each urn from completion through the photo process and onto the website. With an eye for detail, Allen networks well with other artisans, engravers and suppliers. The ability to communicate and negotiate the company’s needs and desires to fulfill whatever is needed from an outside source is very much appreciated by the rest of the team.